“You take an oath of office to obey the Constitution… the Constitution is very clear, you don’t go to war without a declaration,” said Paul. But should Obama’s rampant hypocrisy really surprise us? This is the Nobel Peace Laureate who has more U.S. troops deployed than at any time under George W. Bush. This is a man who came to power promising to end war yet has involved the United States in more conflicts than Bush ever presided over. Indeed, the White House itself characterized the goal in Libya as “installing a democratic system,” a euphemism for regime change, acknowleding that the agenda goes far beyond “protecting civilians,” as Obama claimed during his March 19 speech. White House Counsel Bob Bauer claims that because the US and NATO has reserved its campaign to air strikes, relying on Al-Qaeda terrorists to do the dirty work on the ground (aided by US, British and French Special Forces), this means that the US is “not engaged in sustained fighting.” In other words, because the conflict is pretty much of a turkey shoot so far, with Gaddafi unable to zap fighter jets out of the sky, that turns an act of aggressive warfare into a loving exercise of peaceful slaughter. Barack Obama, the Nobel Peace Laureate, committed U.S. forces to the bombardment promising it would “last days not weeks.” Three months and a billion dollars later and Obama is now preparing to do the one thing he explicitly promised not to – send in ground troops – because the NATO and US-backed Al-Qaeda terrorists just aren’t getting the job done properly. Having ignored his own constitutional lawyers on the legality of the conquest, Obama then set about doing something else he promised was not on the agenda – targeting Gaddafi directly for assassination and regime change. NATO bombs have thus far failed to accomplish that feat, but killing Gaddafi’s three grandchildren on May 1st was at least a consolation. It’s abundantly clear that Obama’s arrogance betrays a President who lives in a world of complete make-believe, thinking his loyalties lie with the UN and NATO and that Congress can go whistle. Unsurprising therefore that during the same speech yesterday Obama chacracterized the people who will be hit by his tax increases, those who earn $250,000 a year, as “private jet owners,” another example of his strident delusion. Three years ago, before Obama had even defeated McCain for the presidency, we foresaw how this corporate marketing creation would be used to front a new wave of “humanitarian” wars sold on false pretenses. “Obama may eventually withdraw a portion of troops from Iraq, but mark our words, they won’t be home long before they are sent off to bomb another broken-backed third world country, this time in the name of a United Nations-backed “humanitarian” war, just as Bill Clinton presided over in Somalia and Serbia with the full support of the establishment political left.” we wrote on November 4 2008 in an article entitled, The More Things “Change” The More They Stay The Same. 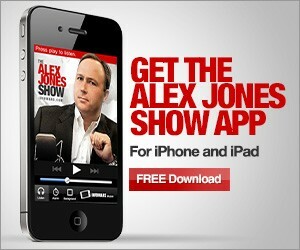 Watch Alex Jones’ recent interview with Ron Paul below.